Today, the Boeing 787 is a successful product, with production rates at 12 units/month, and a total of 521 flying just over 5 years from launch. By comparison, in 49 years of production, Boeing built 1,528 units of the 747. And, having just flown in a 787 from San Francisco to Paris and back, I can attest that it was for me less tiring than in any other plane, which I attribute to the higher air pressure. It is close to that of Lake Tahoe (6225′) while other planes are closer to Squaw Valley High Camp (8200′). Back in 2008-2011, however, the news coverage of the 787 was not so positive, as the plane’s product launch accumulated a delay of more than three years, with analysts pondering what had gone wrong. To keep this event in perspective, we should remember that multiyear delays in product launches have recently been the rule rather than the exception in commercial aircraft, worldwide. In Europe, the Airbus A380 was 2 years late and, in Russia, so was the regional Superjet 100. 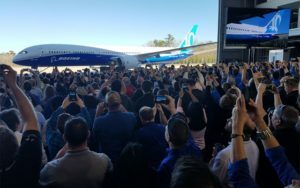 But the question remained of how Boeing, an organization with 100 years of experience in designing and building airplanes, could not have done better. I would like to present here a few explanations that have been proposed, without passing judgment as to whether any or all of them are accurate.